Every man in Britain has, at some point in his life, been part of a team. Whether at school, in a club or perhaps through a sub-culture movement – Mods, Punks or Skaters – teams are part of modern tribal society, defined by a uniform and a dress code. It is how each team-member interprets these codes to express individuality and personality that became the inspiration for Kent & Curwen’s Spring-Summer 2018 Collection. 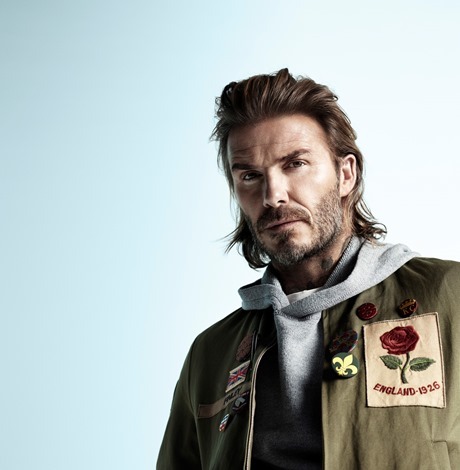 Looking at images from past decades of Oxford and Cambridge sporting teams, Creative Director, Daniel Kearns and Business Partner, David Beckham were particularly interested in the way those gentlemen mixed items of clothing to make a sartorial statement. For inspiration they also explored archive imagery from the 1948 Austerity Games in London, where British Olympians were required to provide their own kit, thereby defining their own national uniform, united by the Union Jack badge worn by all. For Kent & Curwen’s Spring-Summer 2018 collection traditional British summer dress codes are adopted and then systematically broken to undermine expectations and lend an anti-establishment edge to a gentleman’s wardrobe. This is a collection of respectful yet re-imagined sportswear that blurs the boundary between old and new, worn with a British nonchalance. Oversized striped and brocaded Regatta Blazers in silk and cotton silk, badged with the 1926 Rose of England, are dressed down with a mismatching college scarf, tennis shorts, long striped socks and plimsolls or up with matching trousers, a frayed-edge cardigan and detachable collar shirt for a decadent, sporting take on deconstructed tailoring. Cricketing attire, the foundation of the brand in the 20’s and 30’s, is referenced through a more creative lens. The cricket jumper is re-imagined and refashioned as a seasonal statement or presented as frayed-edged and lived-in like old an locker room favourite. Cricketing trousers morph into track-pants worn wide and long with tennis shoes for a decisively informal silhouette. Outerwear remains a key part of the collection. The silhouette is lightweight and long with a dry handle and aged appearance. A nod to the forces comes through a wide lapel trench coat with epaulettes and military buttons. Badging and crests are central to the season, worn proudly on the chest as a signature for a new school / old school generation. House emblems, particularly the Rose of England, appear on singlets or on a sports blanket thrown over the shoulder, oversized on a sweatshirt like a family crest or embroidered in gold bullion on Varsity blazers. Colour for the season takes its lead from track and field with ecru, white and off-white mixed with sand, tan, burgundy and a patchwork of college stripes taken from Kent & Curwen house archive.